Partly cloudy this morning, then becoming cloudy during the afternoon. High 79F. ESE winds shifting to SSW at 10 to 20 mph..
Tehachapi residents soon may see basic street maintenance and repairs in more than 35 neighborhoods within city limits. The City Council adopted a resolution approving a list of projects sent each year to the California Transportation Commission during its April 15 meeting. Two organizations making use of Tehachapi Municipal Airport property to advance students’ learning opportunities — the Civil Air Patrol and the Tehachapi Society of Pilots — are expanding and moving to different spaces on airport property. The Tehachapi City council approved the changes April 15. 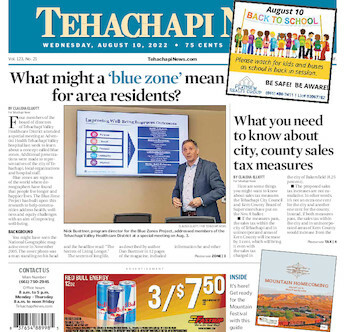 Each week, Tehachapi News publishes a list of civic meetings to help people get involved in local decisions. The Tehachapi Police Department arrested 10 people on suspected misdemeanors and six people on suspected felonies during the week of April 8-14. Tehachapi Mountain Roller Hockey will host evaluations for the upcoming roller hockey season on Saturday and Sunday, May 4 and 5. Tryouts will be held at 126 S. Snyder Ave.
Warrior softball continued their winning ways last week, taking 3 of 4 games in a jam-packed schedule, starting Monday with a game at home against league rival Golden Valley. It took a while for the offense to get going, as the Warriors held on to a slim 2-0 lead into the bottom of the fifth. Tehachapi Mountain Vineyard understands the struggles single parents face, financially as well as emotionally. The church will host its 6th Annual Single Parent Fair to alleviate some of the burden. California State Old Time Fiddlers Association awarded its prestigious Ross and Rae Huffman Award to District 3’s State Director Gayel Pitchford at the 53d annual State Fiddle Contest, held at Lodi on April 12 and 13.